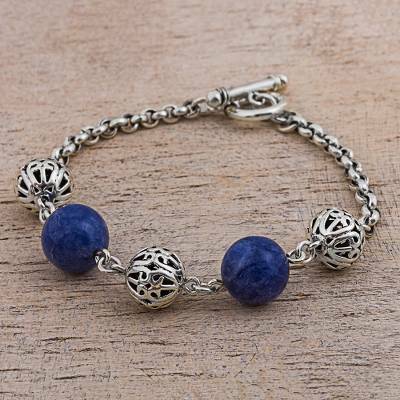 Sterling Silver Sodalite Beaded Bracelet from Peru, "Blue Baubles"
Peru's Marianela Vargas finds a true form of self-expression in this beaded bracelet, which she crafts from sterling silver with openwork silver beads. She adds two beads of cool blue sodalite for an impressive look. You can find sodalite beaded bracelet 'Blue Baubles' by Marianela Vargas in jewelry categories such as Sodalite Bracelets, Silver Bracelets, Sterling Silver Bracelets and Beaded Bracelets. Enjoy exploring these sections for other Novica treasures.